People ask why the Best Ranger Competition is special. The magic of the Best Ranger Competition starts with the raw competition between tactically proficient Ranger qualified service members and continues with the entire community coming together and rallying behind them. The Best Ranger Competition is a celebration of our Army's most proficient and lethal force. The competition would not be the same if any element of the community was missing. The National Ranger Association works to help bring this community together in honor of these modern day marvels. The time spent at Benning provides most the opportunity to take a knee and enjoy the camaraderie. It is a time to network, a time to learn, a time to share ideas and a time to grow. The Best Ranger Competition is more than a competition. It is a package that others strive to emulate and always fall short. Thank you for being a part of the Best Ranger Competition mystique. The National Ranger Association thanks all who support the Best Ranger Competition. Thank you for being in person and joining us in April. Thank you for finding a way to be a part of this amazing community. We have just started to receive commitments for Best Ranger Competition 2015. If you want to see full photos of all the Competition, they are available on the Fort Benning Website that is located here. You can download the FULL LIST OF RESULTS HERE. SI Defense will provide the 2014 Best Ranger Competition winners with custom prize rifles. We are proud to have SI Defense as a new Best Ranger supporter. Once again ROCKY Brands sponsors the 2014 Icebreaker to the Best Ranger Competition. This year's icebreaker is a ticketed event and will be held at the recently renovated Cannon Brew Pub in downtown Columbus, GA. Country music entertainer and RANGER veteran Brandon Holden will be playing for the crowd. For more information contact Candyss Bryant at 706-718-9520 or candyssbryant@gmail.com. This year's supporters and other lucky recipients will receive our commemorative Best Ranger Competition coin. Thanks to great partners like Gray Water Ops we are able to create a product that properly archives the special aura of this unique event. The National Ranger Association raises funds each year to support events surrounding the Best Ranger Competition, The Ranger Hall of Fame and the Distinguished Member of the Brigade. We have some of the best and most loyal supporters, friend and family members. Individuals, small businesses, large companies and charitable entities all come together to support this community and build camaraderie all while watching their legacy compete in one of the most grueling and intriguing endurance events out there. Our supporters are the best. Thank you!!! 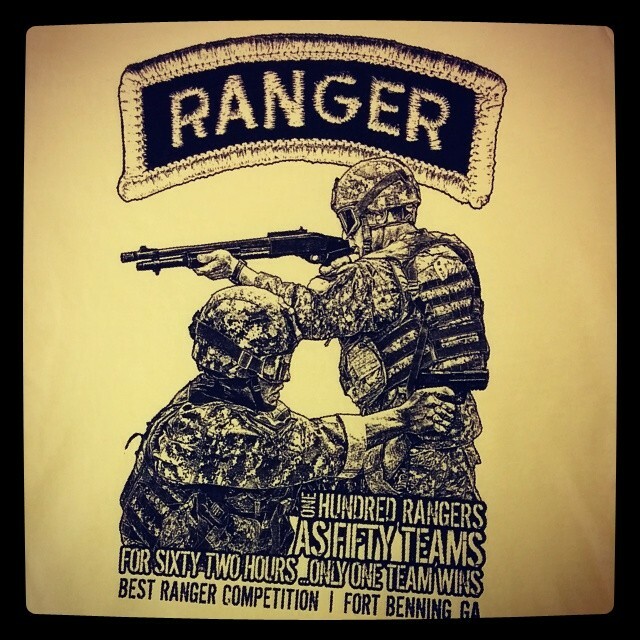 Thanks to Infidels Incorporated the 2014 Best Ranger Competition has been released. This design will be showcased on the annual t-shirt as well as various other competition commemorative items. Here's excerpts from a recent article in Bayonet & Saber about teams training for the 2014 Best Ranger Competition. Soldiers from across the country traveled to the National Guard Warrior Training Center at Fort Benning last week with their eyes set on a spot to compete in the 2014 Best Ranger Competition. The 22 Soldiers from 13 states competed for nine open slots Nov. 20 to participate in the competition next spring. John Burns, assistant operations officer for WTC, said although the event offers limited slots for National Guard participation, he saw an increased turnout compared to last year.